Forecast consumption consumes forecasted demand with actual sales order demand. Each time a new sales order is generated, based on the consumption settings, the forecast demand is decremented by the sales order quantity to avoid counting the same demand twice. The consumption process takes the sum of sales orders in a planning bucket and then consumes the forecast value in each bucket based on the backward/forward days setting – going backward first and then forward. If the setting is days, then the forecast quantity consumed does not go beyond the total days specified (days constrain the amount of forecast that can be consumed within the established time frame). If weekly or monthly is chosen, the forecast in the period is consumed by the order quantity regardless of what day the order falls within the week of the month. The setting is under "Requirement Planning Settings." The forecast consumption works only with Order/Statistical Forecast and MTO Order/Forecast consumption types. 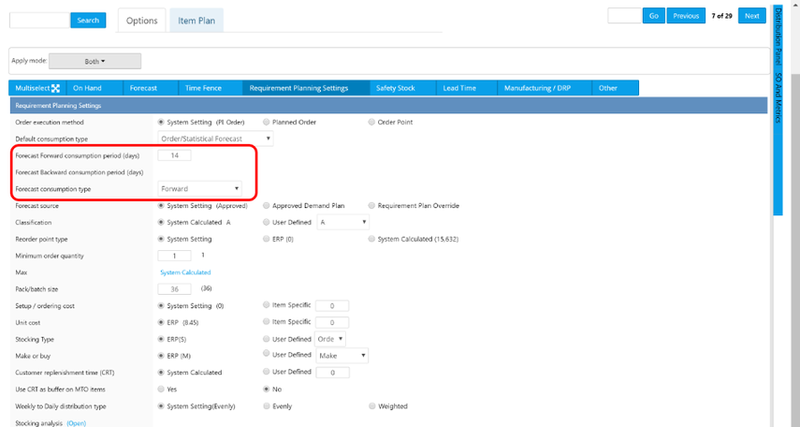 Forecast consumption period and type are defined from Multiple Edit and Options tab under "Requirement Planning Settings." Weekly: Consume the entire weeks forecast. The "Weekly" consumption is available only for requirement planning with daily buckets and works only in the daily horizon. Monthly: Similar to Weekly, it consumes the entire months forecast. The "Monthly" consumption is available only for requirement planning with daily buckets and works only in the daily horizon. Please note that closed orders in future weeks (i.e. shipped early) will also consume forecasts. In addition past due orders and closed orders in the past that are within the consumption period will also be part of the consumption calculation. Please note that the company setting is set to "Use Daily Requirement Plan:" the value will be based on working days. This means weekends will not be included in the calculation - only working days. For example, 14 days would mean 14 working days excluding weekends. In the item options tab under Requirement Planning Settings. The independent demand consumes the forecast which results in the remaining forecast value. This in turn reduces the order point of the item. The total demand value then becomes the sum of the remaining forecast plus order per the Requirement Planning Consumption setting. In short, this means that the reorder requirement will not be overstated due to customer orders consuming the forecast.